We adopted Cheyenne in November 2011 from the el paso, tx humane society. She was a yr old when we got her and is an amazing dog! She acts like a golden retriever, just loves attention and is so loving but she is also super protective. Bless your heart for rescuing your new dog Cheyenne. I am sure she will prove to be a great blessing to all your lives - it sounds as though she already is. Remember, German Shepherds are herding dogs, that's one reason why she's running around the pool so much when your nephew is in the pool - plus they are naturally protective towards their family pack so your Cheyenne is just trying to do her job. Keep her busy, give her lots of exercise and attention and I am sure she will fit in with your family as though she has always been there. Good luck with your new dog - I wish you, your family and Cheyenne all the best! Thank you so much for sharing your story about Cheyenne! I know that is such a wonderful feeling, when you adopt a fur-ever friend, from a shelter, because, about 8 years ago I adopted, my Phoebe, ( she passed away last October, at age 12 ), she was a German Shepherd. She will always be in my heart! 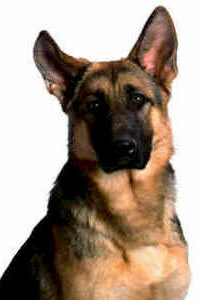 We now have another, German Shepherd----her name is Chloe , & she turned 1, on June 29th! Cheyenne, & you, will be life long friends, & she will be such a good companion, to you!